A pregnant mother of two, her partner and their children have been living in hotel rooms for the past six weeks. Up to 10 fire engines and crews have been tackling the blaze since around 3:30am this morning. The small market town in Somerset was praised for its independent shops and street market. Avon and Somerset Police are asking for help to trace a Frome woman who is missing along with her child. Kelly Watkins, aged 32, and 21-month-old son Finn were last seen getting on a train in Frome at 10.15am yesterday morning. Police say Kelly may have told a member of the public she was travelling to Preston to see family. She is described as white, slim, 5ft 10 and was wearing leggings and a purple cardigan over a tie-dye top. Finn was wearing a babygro and a lightweight green and blue raincoat. Police say Kelly is vulnerable and are asking anyone who sees her or Finn to call 999. A schoolboy from Frome has won a competition to have his design featured on the Royal Mail's first class Christmas Stamp. 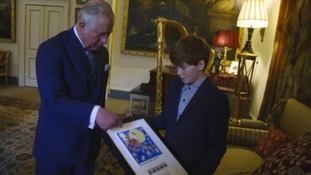 Prince Charles picked 10-year-old Ted Lewis' picture from more that two hundred thousand entries. Ted says that it is incredible that his stamp will be seen all over the world. Formula 1 driver Jenson Button has been disqualified from his latest competition - an Iron Man race. A teenager from Somerset was refused funding on the NHS to treat a rare type of cancer. But the community rallied around Daryl Allinson. It's been confirmed that international rock band the Foo Fighters will be one of the headliners at this year's Glastonbury Festival.